Organophosphorus insecticides are widely employed in agriculture, and residues of them can remain after harvesting or storage. Pesticide residue control is an important task for ensuring food safety. Common chromatographic methods used in the determination of pesticide residues in food require clean-up and concentration steps prior to quantitation. While solid-phase extraction has been widely employed for this purpose, there is a need to improve selectivity. Due to their inherent biomimetic recognition systems, molecularly imprinted polymers (MIP) allow selectivity to be enhanced while keeping the costs of analysis low. In this work, a MIP that was designed to enable the selective extraction of fenitrothion (FNT) from tomatoes was synthesized using a noncovalent imprinting approach. The polymer was prepared using methacrylic acid as functional monomer and ethyleneglycol dimethacrylate as crosslinking monomer in dichloromethane (a porogenic solvent). The polymer was characterized by Fourier transform infrared spectroscopy, solid-state nuclear magnetic resonance (NMR), scanning electron microscopy (SEM), and nitrogen sorption porosimetry. The pore structure and the surface area were evaluated using the BET adsorption method. To characterize the batch rebinding behavior of the MIP, the adsorption isotherm was measured, allowing the total number of binding sites, the average binding affinity and the heterogeneity index to be established. A voltammetric method of quantifying FNT during the molecularly imprinted solid-phase extraction (MISPE) studies was developed. The polymer was placed in extraction cartridges which were then used to clean up and concentrate FNT in tomato samples prior to high-performance liquid chromatographic quantitation. 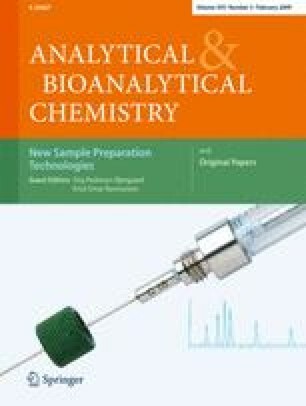 The material presented a medium extraction efficiency of 59% (for analyses performed with three different cartridges on three days and a fortification level of 5.0 μg g−1) and selectivity when used in the preparation of tomato samples, and presented the advantage that the polymer could be reused several times after regeneration. The authors gratefully acknowledge the financial support from CAPES and FAPESP (2007/02306-9), and thank Professor C.H. Collins for language assistance.